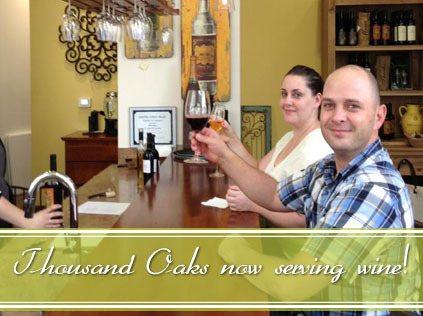 We Olive Thousand Oaks Now Serving Wine! Posted on Friday, August 23rd, 2013 at 7:04 pm. We Olive Thousand Oaks is now serving wine! The retail store and wine bar, located in the Oaks Mall, opened earlier this year with a focus on California Extra Virgin Olive Oil, artisan vinegars and gourmet foods. They are now adding small-production, boutique California wines to their offerings. Wine service begins this week with a menu of classic California varietals, like the 2011 Lost Canyon Chardonnay and more esoteric finds, like the 2012 Falcor Trousseau Gris, both from the Russian River Valley. All of the wines, which are served by the taste, glass and bottle, come from diverse growing regions around the Golden State and showcase California’s range of wine styles. Wines offered in the wine bar are also available for retail purchase. Check out the full wine list here and make sure to follow We Olive Thousand Oaks on Facebook for announcements about the wine bar, plus happy hour specials and wine tasting events!